475th H.T. Coy, 10th Div. Train, Army Service Corps. Died of Malaria 8th Sept. 1916, Aged 36. Arthur Frederick Palmer was born on the 9th December 1879 at 15 High Street, Loughborough. He was the seventh son of Dr William Grimes Palmer and Mrs Elizabeth Anne Palmer, who had twelve children: Lucy Jane, William Grimes, Henry John, Ethel Alice, John, Edith Elizabeth, Arthur Frederick, Gertrude, Edwin,Sybil, Kathleen Mary and Margaret Elsie. The family moved to Thorpe Cottage, Derby Road, Knightthorpe, Loughborough where Dr Grimes died on the 15th November 1889 aged 45, leaving Elizabeth a widow. His personal estate was £1,757 16s 6d. Fred Palmer was educated at the Loughborough Grammar School and was well known and liked in the town. He was a member of local sports clubs and enjoyed taking part, especially in football where he was a member of the Loughborough Corinthians Football Club. He was also a good oarsman and a member of the Loughborough Boat Club. Fred acted as goalkeeper for the Loughborough Hockey Club and was regarded as a ‘sound and useful player’. In 1901 he was working as a mechanical engineer. Arthur volunteered for active service at the outbreak of the war and enlisted in the Army Service Corps in August 1914. He went all through the Gallipoli campaign and served with the Salonika Army. He was offered a commission, which he declined. He contracted malaria whilst on active service in Salonika and died at the Base Hospital on the 8th September 1916. 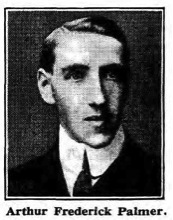 His death was reported in the Loughborough Echo on the 15th September 1916. 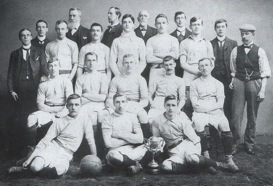 Loughborough Corinthians FC, winners of the Leicestershire Junior Cup, 1900/01. Arthur Palmer middle front row. 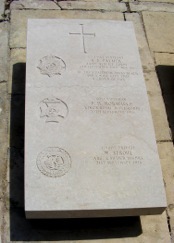 Serjeant* Arthur Frederick Palmer is buried at Triq Id-Duluri Military Cemetery, Pieta, Malta. Grave reference: C. XI. 6. * Serjeant is the traditional spelling with Sergeant becoming popular after 1918.